Many comparisons have been made between today’s financial and economic crisis and the Great Depression, none more than the specter of deflation. Well, contrary to what happened during the Great Depression and contrary to the deflationary forecasts of government leaders, central bankers and economists, deflation, while always possible, is, in this man’s opinion, highly unlikely. Why’s that? Because the monetary and political framework of today is nothing like that of the early 1930’s. In fact, it’s nothing like anything seen, ever. Quite simply, today’s monetary and political framework is built for inflation, as much inflation as the government, the Federal Reserve and their banking partners want. And inflation, and a whole lot of it, is exactly what we are about to get. Let’s begin with some definitions to help us through this discussion. Today, when most people talk inflation, they mean generally rising prices, and when they talk deflation, they mean generally falling prices. This leads to endless consternation because it confuses cause and effect. For the purposes of this essay, inflation will be defined as it was in yesteryears, as an increase in money and money substitutes, which, holding all other things constant, brings about higher prices. The former we will call inflation, the latter we will call price inflation. Deflation will be defined as a decrease in the supply of money and money substitutes, which, holding all other things constant, brings about lower prices. The former we will call deflation, the latter price deflation. Why are these distinctions important? Because they focus attention on the driving force behind price inflation and price deflation; that being, the Federal Reserve and the fractional reserve banking system. Now, what is so different about today’s monetary and political framework versus that which existed on the eve of the Great Depression? Simply put, all the checks on inflation, all the deflationary holes in the system that brought on the deflation of the 1930’s have been removed. In so doing, the government, the Federal Reserve and their banking partners have given themselves all the tools necessary to create as much inflation as they like. What we have today is a fiat based monetary system at the discretion of politicians and bankers bent on printing and spending our way to supposed prosperity (not to mention helping a few campaign reelections and banking interests along the way). That is not what we had on the eve of the Great Depression, not even close. On the eve of the Great Depression and until 1933, there was nothing to protect banks from prudent depositors wanting their money, that being currency or gold, or conversely, to assure depositors that there money was safe when they feared for their savings. Fractional reserve banking, where banks are permitted under law to loan out depositor money, while pretending the money is still in their vaults redeemable on demand, is an inherently unstable system, always susceptible to a bank run. (1) Murray Rothbard, the great Austrian economist and expert on the Great Depression (Ben Bernanke isn’t the only one), taught that it’s this fear, the fear of a bank run that keeps the banking system in check. To paraphrase Rothbard, there is nothing like a bank run to squeeze inflation out of the system. So when things started going wrong in 1929 and worsened thereafter, true to form, scared depositors, fearing for their savings, withdrew their money from the banking system en masse. Deflation, via a contraction in bank loans and deposits, engulfed the early 1930’s. To make sure this never happened again, the government in 1933 created the FDIC giving the US banking system federal deposit insurance. Today, back-stopped by the Federal Reserve’s printing press, the FDIC insures all bank deposits up to $250,000. (2) And when and where FDIC insurance falls short, both the government and the Federal Reserve have shown they will stop at nothing to provide trillions of dollars in asset and or debt guarantees, even equity capital to any and all banks to keep depositors in the banking system. I ask you, when’s the last time you saw a bank run? That’s right, the Great Depression. Today, the banking system can inflate without fear of a bank run. On the eve of the Great Depression, the Federal Reserve’s monetization activities were essentially limited to Treasury securities, banker’s acceptances and direct loans to member banks, the latter largely consisting of rediscounted business paper. In 1932, the government greatly expanded those monetization tools by broadening the assets eligible as collateral against Federal Reserve loans. Today, with the passage of the Monetary Control Act of 1980 and several other “tweaks” along the way, the Federal Reserve can pretty much buy anything it wants, from any bank or non-bank that it wants, by writing a check on itself. And it can pretty much loan money to any bank or non bank that it wants, virtually with whatever collateral it deems worthy. Think Ben Bernanke’s alphabet soup of funding programs. Think the defacto nationalized of AIG. Until the establishment of social security and unemployment insurance in 1935, there was no large scale federal social safety nets through which money could be injected into the economy. Today, we have a plethora of long standing, and deeply imbedded safety nets, overseen by politicians able, willing and ready to use them, especially when they are funded, not by taxes, but stealth through the printing press of the Federal Reserve. Think about that. The ability to inject an unending stream of newly printed money to needy recipients sure to spend. How big is this stream of money? Given that the unfunded liabilities of social security, medical insurance and other trust funds are some $55 trillion, about 3.5 times nominal GDP, and growing rapidly, very big indeed. Hoover, FDR, indeed all subsequent administrations have given us all sorts of bailout packages over the years. But I think we can agree that we have never seen anything like this before. Some $30 trillion in bailout money has been advanced or guaranteed by the Treasury, FDIC and Federal Reserve in response to this crisis. And it’s likely not over. Simply unprecedented. Combine government bailout packages and social nets with the Federal Reserve’s printing press, and throw in a few government make-work programs for good measure, and what do you get? A huge and determined spender of last resort, with bottomless pockets. This year’s federal deficit, the one the Federal Reserve is now telling us it plans to increasingly monetize, is likely to surpass $2 trillion. And by the looks of it, we are only getting started. On the eve of the Great Depression, the US was a nation of savers and a creditor to the world. Today we are the largest debtor in the world. Given that inflation favors debtors, vote seeking politicians can be “excused” if they see the “value” in inflation; and voters, neck deep in debt, with little savings to boot, can be “excused” for voting them into office. And if foreigners take dollars in return for their mercantilist toil, only to deposit those dollars in US government IOU’s wholly denominated in currency they know is coming off a printing press, then hey, what’s not to like about inflation. Sure the US is paying off its foreign obligations in deflated dollars, but foreigners don’t vote, right. During the Great Depression, there were numerous voices, even inside the Federal Reserve, calling for free markets and advising against government intervention. Who today argues against an active government and for free markets? Very few. Think no further then the highly respected Federal Reserve Chairman Ben Bernanke. This is a man who has waited his whole career to prove that it was the Federal Reserve and its tight monetary policy before and after the stock market crash that gave us the Great Depression, that the correct policy response by the Federal Reserve post the stock market crash was to print money and to continue printing money until economic recovery was assured. Unfortunately, the opposite is the case, and it is why a Bernanke led Federal Reserve virtually guarantees inflation. Contrary to what Bernanke thinks, the Great Depression was caused by the low interest rate and loose monetary policies of the Federal Reserve in the 1920’s. These policies created the 1920’s boom which NECCESITATED the stock market crash of 1929 and economic bust of the early 1930’s. You see, by lowering interest rates and increasing the money supply, you create economic and financial distortions – mal-investments, which eventually must be liquidated. Sooner or later, the Federal Reserve induced boom of the 1920’s REQUIRED a bust, and there was nothing the Federal Reserve could have done to prevent it. (3) Does this have a familiar ring? It should, because it’s the same policies that caused today’s economic mess. So how can more of the same “fix” the current economic and financial crisis? It can’t. Indeed it will make matters worse. And when it does expect a clueless Bernanke to respond with yes, even more inflation. Let’s recap. A run on the banking system or the Federal Reserve, what gave us the deflation of the 1930’s, is no more. The Federal Reserve and the fractional reserve banking system have virtually no limitations on their ability to inflate. The transmission mechanism through which money can enter the economy isn’t limited to just the banking system anymore and its ability or desire to pyramid loans on top of reserves. Not by a long shot. The Federal Reserve can inject money directly into the economy, bypassing the banking system altogether. And then there is the federal government as the spender of last resort, perhaps at this juncture, the most important inflation outlet in the new inflation toolset. And to top it all off, we have a clueless Ben Bernanke at the inflation levers, as the world cheers him on. Like I said, today’s monetary and political framework - it’s nothing like anything seen, ever. Do the Facts Confirm the Theory? As articulated above, artificially financed by the inflationary policies of the Federal Reserve and its fractional reserve banking system, the 1920’s boom-turned-bust created massive economic and financial distortions – mal-investments, which necessitated liquidation. The resultant business and in turn bank failures eventually led to runs on the banking system and on the Federal Reserve itself. Now contrary to popular belief, beginning with and in response to the stock market crash, the Federal Reserve tried repeatedly, and in increasing intensity, to pump money into the economy by expanding its balance sheet, to halt the deflation and to get banks to reflate. Clearly hampered by the burden of the inflation checks of yesteryear, it failed. (4) Between 1929 and 1933, nothing but deflation. M1 fell 25% and M2 fell 31%, as demand deposits collapsed by 35%. Then, beginning in 1933, the federal government and the Federal Reserve, realizing the deflationary holes in the monetary system, began bulking up. As noted, of special import, in 1933, the creation of the FDIC and the termination of domestic gold redemption. And it worked. Between 1933 and 1937, M1 rose by 55% and M2 rose by 42%. After a brief respite in 1937 and 1938, driven by the Federal Reserve’s attempt to mop up excess reserves in the banking system by doubling reserve requirements, the money supply kept right on growing; right up through the end of the Depression and into World War II. Simply the biggest balance sheet expansion in history. Should we have expected less? Other than a minor setback in M1 in 2007, on the heels of the housing bust, no deflation, anywhere. Finally, note the surge in M1, M2 and MZM from their 2007 lows. Depending on the measure, year over year growth rates are now running 10%, plus. Unlike the early 1930’s, Federal Reserve largesse is having its intended effect. Let’s stop and think about this for a moment. Despite the biggest financial and economic crisis since the Great Depression, and contrary to all the deflation warnings from the “experts” we have inflation. Yes, we have had some close calls, with lots of banking mergers and consolidations orchestrated, indeed back-stopped, by the Federal Reserve / Treasury tag team. But in the end, no bank runs. Let me repeat, an implosion in private sector credit markets, a de-leveraging of monumental proportions, and we have inflation at double digit rates. Do you think that these new inflation tools are working? Amen Steve. Now we know why? OK. I can hear you now. Yes, deflation avoided and money supply up, but given the explosion in the Federal Reserve’s balance sheet, one would have expected an explosion in money supply too. What happened? 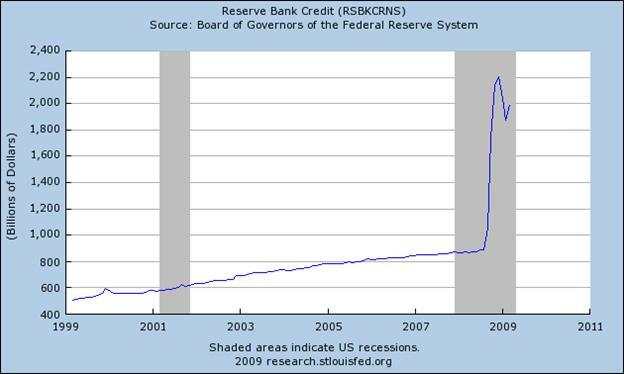 Since the Federal Reserve began ballooning its balance sheet, some 98% of the banking reserves so supplied were channeled into excess reserves by the banks. Normally banks hold 3% to 4% of their reserves as excess reserves. Currently they hold about 92%. If they had instead pyramided loans and investments on top of those reserves, as per their normal practice, the money supply would have indeed exploded. Why didn’t the banks channel those reserves into loans and investments and what will in fact make them do so? To the extent the banks do lend or invest, are not these reserves under the control of the Federal Reserve, i.e. ; can’t the Federal Reserve withdraw those reserves whenever they deem appropriate, thereby capping inflation? What if the banks in the end don’t lend or invest, or don’t to the full extent of the Federal Reserve’s reserve requirements; does that negate the inflation case? To answer this question we must first understand what these excess reserves are and what they are not. As was the case in the 1930’s they ARE NOT cash set aside by banks because of, or in fear of bank runs and therefore locked away for years to come. Why would they be, with FDIC insurance and all manner of government and Federal Reserve loans and guarantees readily available to soothe the nerves of depositors and to back-stop bankers? They ARE though a prudent way for banks to park funds while the government and Federal Reserve cleanse bank balance sheets, reflate the economy and pave the way for the pyramiding opportunities to come. Call it inflation in the pipeline, and a whole lot of it too. Let me explain. In the post Great Depression era, in times of financial and economic crisis, banks bought US Treasuries, as they offered the safest way to ride out the crisis, build cash and ready oneself for the next boom. Not this time, at least in the size you would have expected. No this time banks are investing in excess reserves, risk free. And the reason is simple. 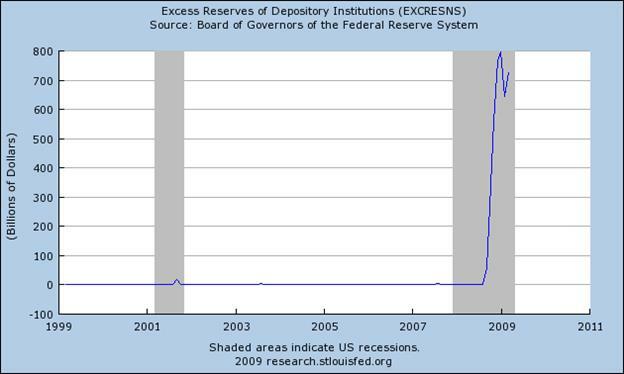 The Federal Reserve for the first time in history pays interest on reserves, currently at .25%. That may seem small, but not compared to the Federal Reserve manipulated micro rates on 3 month Treasury bills or Federal Funds. Excess reserves are in fact the best risk adjusted deal on the block. Pocket change, you say. True. But if you are a CEO of one of those too-big-to-fail banks and you can make money risk free by leaving it with the Federal Reserve, rebuild some capital in the midst of the biggest credit crisis since the Great Depression, and do it while the Treasury and the Federal Reserve absorb your loses, you do it. The game plan is to get across the finish line, with cash in your pocket, to be ready to disgorge that cash into the next reflation trade, to the maximum extent possible. And if you’re lucky, or should I dare say “well connected,” you might even get a few of those not-too-big-to-fail banks handed to you by the government on the cheap, after they have been purged of their toxic assets of course. And where you say is this next wave of inflation, the one the banks are waiting to pounce on? No one knows for sure where all this is ultimately going, but in this man’s opinion, the next inflation wave is likely to start where it always does - in or around the primary monetary injection point. And this time that’s the government complex and all it touches. Indeed, the spender of last resort, led by Obama, and the printer of last resort, led by Bernanke, are already on the case in unprecedented fashion. Wherever they direct their energies, profit seeking banks, armed with a mountain of reserves, will soon follow. They sure are under the Federal Reserve’s control and taking them back is exactly what Ben Bernanke says he plans to do. Of course we want the banks to lend, says Bernanke, and we will do everything thing in our power to make it happen. But all this talk about runway inflation is totally misplaced. You see, says Bernanke, once the credit markets return to normal and we are assured of economic recovery, we are going to withdraw these excess reserves, forthwith. Presto, no inflation problem. First, it is not just the size of the reserves that are in question; it’s the composition of the assets behind it. Well over half of the Federal Reserve’s balance sheet is toxic – long-dated, and still deteriorating mortgage and consumer claims likely marked at prices well above market clearing rates. Gone are the days when the Federal Reserve’s balance sheet was Treasury IOU’s. Now, in order to withdraw reserves, the Federal Reserve must sell securities. But, if the Federal Reserve is increasingly being “asked” to fund mounting government spending programs by buying Treasury IOUs, that means the only assets it has for sale is overpriced toxic securities. Under those circumstances, do you think the Federal Reserve might have a hard time reducing its balance sheet and withdrawing reserves? Do you think the market knows it too? The last thing the Federal Reserve will want to do is dump these assets onto the market. The mere mention would cause the prices on these assets to tank and interest rates to surge. Indeed, there is likely only one buyer for these assets at anywhere near current marks, and that’s our spender of last resort, the government. And if the Federal Reserve does in fact decide to sell these assets to the government (for example for optics), how do you think the government is going to pay for it? By issuing IOU’s to the Federal Reserve in return for money printed out of thin air, that’s how. Conjures up a picture of a dog chasing its tail, doesn’t it. Second, everything the government and the Federal Reserve are doing today is not going to turn the economy around. In fact, it’s almost guaranteed to make things worse. A country can not print and spend its way to prosperity, especially one as distorted as ours, particularly when the government, the bastion of inefficiency and waste, is doing all the heavy lifting. The 1930’s are a case in point. As such, this is hardly an environment that lends itself to a contraction in the Federal Reserve’s balance sheet in the eyes of a Ben Bernanke. That’s for sure. Let’s start with the undeniable fact that even though banks are stock piling reserves, the money supply is still growing at double digit rates. As Doug Noland chronicled, the government, its agencies and the Federal Reserve have all stepped up and are injecting money directly into the economy. The banks have been bystanders, yet, we inflation at double digit rates. This then raises an interesting question. With all the new inflation tools at its disposal, maybe the Federal Reserve doesn’t need the banks to inflate, at least to the same extent it has in the past. Think for a minute. Are not Fannie Mae and Freddie Mac lending money to home buyers and is this not being financed by the Federal Reserve, both directly through purchases of their debt and indirectly through monies supplied by the US Treasury? Is not the FDIC bailing out bank depositors, ultimately back-stopped by the Federal Reserve’s printing press? Is not the government spending huge and growing sums of money, increasingly being financed by the Federal Reserve? Yes, yes and yes. Now consider this. What if the banking system is nationalized, a la Fannie and Freddie? Or like AIG. It could happen, if not in name then in substance. Then the banks will be told what do, wont’ they. Now that’s a scary thought, don’t you think? A whole lot of inflation is in our future, one way or another. Ok, lots of inflation and lots more to come. But how big is this inflation, really? In his April 3rd Interest Rate Observer , James Grant reported that the combined Federal Reserve and US government response to this economic crisis, defined as the change in the Federal Reserve’s balance sheet plus the US government’s fiscal deficit as a percent of GDP, is some 30% of GDP. To put that number into perspective, that’s 10 times the postwar recession average of 2.9% and 3.5 times the previous record of 8.3% seen in you guessed it, the Great Depression. The size of today’s government’s reflation efforts truly dwarfs anything we have seen in the past and suggests some truly eye-popping price inflation rates in the future. On that score, it’s interesting to note that the greatest price surge in the post gold standard / FDIC era, one that saw the CPI rocket to 15%, began during the 1973-74 recession with a combined Federal Reserve and government response of a mere 4% of GDP. At today’s 30%, and we are not done yet, one can only imagine the kind of price inflation that awaits us this time around. Great stuff on the inflation-- but I was wondering how this coming wave of inflation will affect the stock market? Are we looking at a wild-yet-worthless ramp-up or a crash with lots of paper cash to the downside? The frightening-looking graphs would be better shown using a semi-logarithmic scale, which would show the surges in money and credit supply in correct proportion to their previous values. I think the recent and current surges would still look frightening, but more authentically so. Does the St. Louis Fed not provide them in semi-logarithmic form?